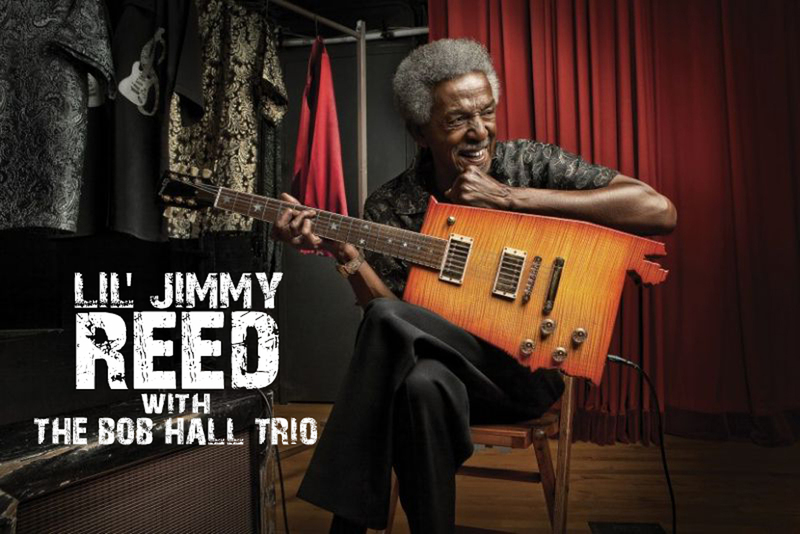 Still playing and touring the World, Lil’ Jimmy Reed is the last of the original Louisiana bluesmen. At 77, Leon Atkins, better known as Lil’ Jimmy Reed, is the real deal, as will be attested to by anyone who has been privileged to hear his stinging guitar work, gritty vocals and haunting harmonica. A tall charismatic figure, Lil’ Jimmy epitomises the classic Louisiana down-home blues tradition. Born in the late nineteen-thirties in a shot-gun shack in Hardwood, LA, a small cotton and sawmill town on the Mississippi River, Leon grew up near a club where every night he absorbed the wail of the blues from across the street. At six he had his own guitar, made from a cigar box, and by the time he was a teenager he was proficient on both guitar and harmonica, playing local clubs around Baton Rouge. Filling-in one night for blues star Jimmy Reed earned him the sobriquet Lil’ Jimmy Reed and started him on the long path to success. After years of playing small clubs and taverns, Lil’ Jimmy took time out to serve his country in the military. Since his return to civilian life his career has blossomed. He has shared the stage with B. B. King and Bobby “ Blue” Bland and head-lined festivals in the UK, Ireland, Belgium, Holland, Germany, Denmark, Sweden and Switzerland. In 2016 he will add Italy and Spain to his tally. His many fans recognise that Lil’ Jimmy’s performances are almost the last chance to hear the raw, unadulterated sound of authentic Louisiana blues. In the sixties, the blues came to Britain and inspired a generation of teenagers who in turn took the music to international success. Prominent amongst these young men was the critically-acclaimed pianist Bob Hall, whose distinctive blues and boogie style on hundreds of recordings has influenced a host of others. Bob and his wife, the dynamic singer and rock-steady bassist Hilary Blythe, have joined forces with Lil’ Jimmy to form The Lil’ Jimmy Reed Band. Over the past five years this tight little outfit has given a series of show-stopping performances all over Europe.